ProRehab is proud to announce that one of their own, Aaron Goelzhauser, PT, DPT, OCS, has organized a walk for area individuals who have undergone joint replacement and their family and friends. 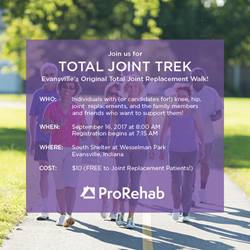 Registration for the Total Joint Trek, which will be held at Wesselman Park in Evansville, begins at 7:15 AM. The walk will begin at 8 AM and offers three options for interested participants: a half-mile walk, one-mile walk, or two-mile walk. Individuals with knee, hip, shoulder, or ankle replacement are invited to register for the event, as are candidates for joint replacement and their friends, family, and members of the community. Registration information, event sponsorship information, and the course layout can all be found at http://www.TotalJointTrek.com. The walk is free to participants that have had joint replacements and $10 for all other participants. One of the most important goals of the event is to improve strength and stamina in total joint replacement patients and candidates. Thus, Dr. Goelzhauser encourages proper aerobic conditioning before participating in the event. ProRehab’s expert physical therapists are the best first choice for rehabilitation and injury prevention in the tri-state area. For more information about ProRehab, or to build a specific conditioning program with one of ProRehab’s expert therapists, please visit http://www.ProRehab-PC.com. Founded in 1999, ProRehab is a locally owned private physical therapy practice with over 17 years of experience as Evansville, southwest Indiana and western Kentucky’s preeminent provider of outpatient physical therapy. ProRehab’s therapists have a wide range of clinical expertise in manual physical therapy, spine care and rehabilitation, general orthopaedic conditions, sports specific injuries, hand injuries, workplace injuries and more. 100% of our expert practitioners are either board certified or in the process of completing advanced residency, fellowship, or clinical mentoring programs, allowing them to provide the highest standard of care to our patients. For more information visit ProRehab-PC.com or find us on Facebook by searching ProRehab, PC or on Twitter at @ProRehab.